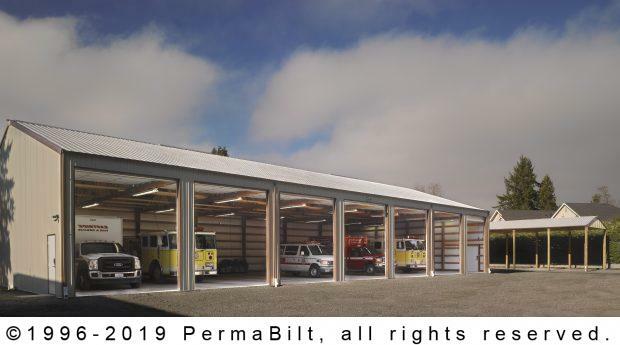 A Fire and Rescue Department on King County’s Eastside required (2) large post frame commercial steel buildings to store and protect an array of Fire and Rescue vehicles and equipment storage. The primary shop was 50’ x 96’ x 15’. A public works job, the specifications were presented to contractors in the area. The specs called not only for the buildings but also for site preparation and electrical work. 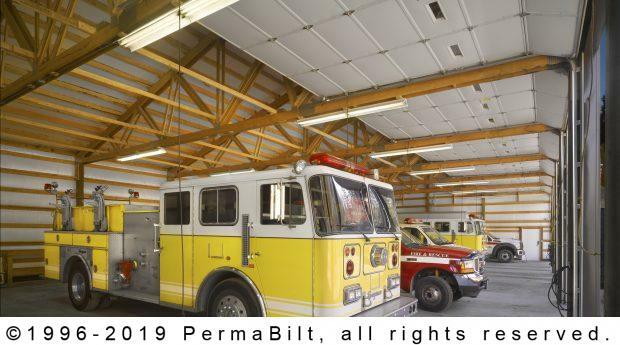 PermaBilt® subcontracted this portion of the project to an excavation contractor and electrical contractor that met with the Fire and Rescue Department’s approval. The 50’ x 96’ floor took 66 yards of concrete. The 4” thick concrete was shop finish and contained zip-strip crack control. 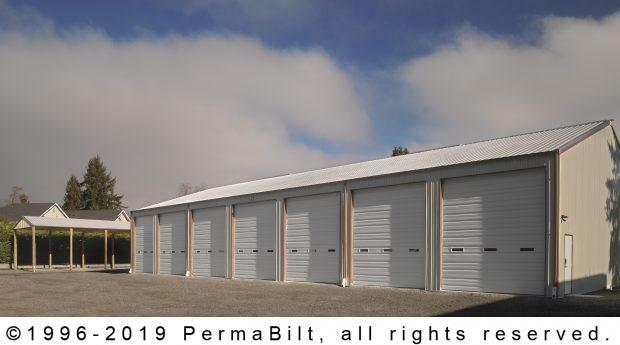 The top feature of this post frame building were the (7) large commercial grade insulated overhead garage doors w/lites. (6) of the doors were 12’ x 14’ and (1) was 10’ x 14’. (2) PermaBilt 3’ x 6’8” entry doors contained card reader locks to match the rest of the existing locks per the project specifications. The secondary storage building was 21’ x 60’ 14’. It contained room for numerous vehicles and equipment however it was designed similar to a carport, only much bigger. It had (5) large bay openings. There was no concrete added and no siding, only a roof with 5” K-Line gutters and downspouts. “Thank you – will highly recommend your company to others and most likely will use you again in the future."